The name Alan Rogers is synonymous with European campsite guides, and the company’s range of guides for 2011 covers 27 European countries. All campsites are inspected by Alan Rogers’ Site Assessors, who travel to and inspect sites and produce reports on each site’s facilities, pricing details, style and location. Campsites cannot pay to be included in the guides and are only included on merit – hence the title of Alan Rogers’ main series of campsite guides is The Best Campsites In… These guides do not include a comprehensive directory of all the campsites in a country, only a selection of those chosen as the best by Alan Rogers. 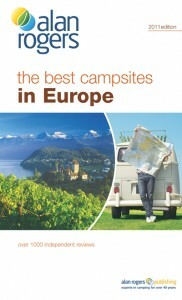 I recently received a copy of The Best Campsites In Europe 2011 to review. This guide covers more than 1,000 campsites in 22 European countries, excluding Britain and Ireland, because they are covered in a separate guide. The Europe guide also only includes a limited selection of sites in France, Italy, Spain and Portugal, as these countries also have separate guide books dedicated to them. Despite this, Italy and France still get more coverage than any other country (80+ pages each), but this is obviously only a small selection of what is available. For comparison, Alan Rogers’ campsite guide for France has 544 pages. The campsite reviews themselves are quite obviously genuine and written by impartial observers who have visited the site. A detailed listing of all facilities is included for each site, as is pricing information and other characteristics of the site – such as whether it is dog-free, naturist or open all year. Opening dates are included as are directions to and GPS coordinates for each site. There does seem to be a bias towards larger, more ‘organised’ sites, but this reflects the types of site most commonly found in many European countries, so is not really a criticism. Overall, I found the The Best Campsites In Europe easy to use and convincing – that is to say, it gave me a good feeling of confidence about what I would find should I visit each site.